The recent wastewater blowout of the abandoned Gold King Mine in Colorado on Aug. 5 has caused great anxiety in Silverton, Colo., a small town with a population of 600. 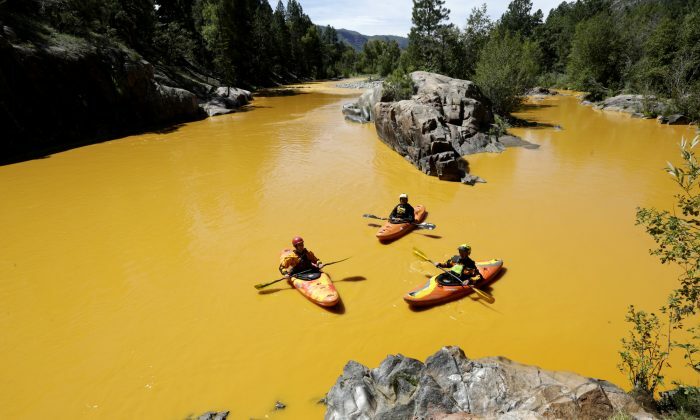 The nauseating orange toxic spill put a damper on the town’s peak outdoor tourism season with the rivers closed down for testing; locals were told not to use the water for drinking or irrigation; and the long-term effects locally and downstream are still unknown. Unfortunately, Silverton residents have dealt with spills before. In the 1970s and 1980s, there were similar blowouts. Some were even worse than this one, according to Bill Simon, coordinator for Animas River Stakeholder Group, a grass-roots group that addresses environmental issues caused by abandoned mines. But on those occasions the water turned gray, so it wasn’t as noticeable, he said, and it wasn’t during the tourist season. The problem of the old Gold King Mine took center stage after Environmental Protection Agency (EPA) workers accidentally opened a passage releasing 3 million gallons of metal-laden toxic sludge into the watershed. The reality is, the mine had already been leaking the sludge at 100 gallons per minute since 2005—now it’s at 250 gallons per minute, according to Simon. The Gold King Mine has been inactive since 1922 when it collapsed. Because of the collapse, water has been trapped in the mine, but “it wasn’t completely blocked because water has been leaking out slowly and contaminating the Upper Animas,” said Simon. In the 1990s there was a noticeable increase in the flow of the leak, according to an EPA Gold King Mine fact sheet. After the last big mining company in the region, Sunnyside, stopped mining, water found natural fractures, which allowed it to flow into the Gold King Mine. Unfortunately, the problem of the Gold King Mine isn’t unique. There are hundreds of abandoned mines in the Animas River area, said Matt Rice, Colorado River Basin director for American Rivers, a leading national river conservation organization that focuses on protecting rivers. Rice said about 40 percent of the other abandoned mines have been leaking toxic water into the Animas River for years. The EPA and the Colorado Department of Public Health and Environment (CDPHE) assessed the Animas River area in 1991 for a potential Superfund designation—the federal government’s program to clean up the nation’s uncontrolled hazardous waste sites. They determined that the Animas River near Silverton was not achieving water quality standards and aquatic life was being severely impacted due to numerous mines leaking in the area. The agencies didn’t take action at that time and permitted the local community to work on the problem. Since then, other events may have made things worse. In 1996, 2001, and 2002, Sunnyside bulkheaded (walled off with concrete) different parts of its mine called American Tunnel, which caused the water table to increase throughout the entire mountain, so more water started coming out of other mines, according to Simon. The Red and Bonita Mine, which leaks 300 to 500 gallons of wastewater per minute, had similar concrete closure under construction when the Aug. 5 spill occurred. “Before they put bulkheads in the American Tunnel, that [Red and Bonita Mine] was dry for nine months out of the year and other months 30 gallons or less,” said Simon. Since the recent eruption and because the other bulkhead caused the water table to rise, the Red and Bonita Mine project has been halted, but other mines across the Animas River region keep on leaking. While the Silverton spill continues to need urgent attention, the reality is, it’s only one episode in the region’s long history of dealing with the legacy of a centuries-old mining boom—a boom that once helped populate the region, and now leaves the population with the a heavy toxic burden. Water use is limited until the long term effects of the toxic metals can be resolved.